Significant generations have frequently been defined by their respective “revolutions.” From the Industrial Revolution of the 19th century to the Technology Revolution of today, humans have held a fixation with improving upon past ideas. Somewhere along the way we began to equate being revolutionary with being relevant. However, as our generation has endlessly searched for this innovation, it seems that there has been a consequent rejection of traditionalism in business. In startup and venture capital culture in particular, we have seen a shift from a strictly vertical power structure to one of horizontal thinking and collaboration. Moreover, advancements in technology have brought individuals from across the world and their ideas ever closer. Clay Christensen’s novel The Innovator’s Dilemma outlines the problem that larger companies have spurring innovation from within and embracing new technology to improve efficiency. Although the advancements in technology have increased access to information, the ability to revolutionize has become confined to a few standout individuals. For students, there is an oversaturation of information that individuals are unable to utilize; when given too many options, many freeze. Being surrounded by such explosive growth can be both inspiring and overwhelming, as the need to create something original and meaningful is more stressful than ever. This tension underscores the necessity of shifting how we identify and incorporate innovation in our lives. Perhaps we should stop searching for the “revolutionary” and start looking for the practical, the tangible. By sharing information and building off one another’s expertise, we enable a better, more cooperative world. The 43rd International Conference aims to capitalize on the principles of sustainable innovation to inform a new approach: one that transcends the “temporary fix” and that has structural endurance. Over the three days, we will start from the foundations and restructure the way we define and implement innovation, providing a framework and network whose bounds can extend far beyond the conference. Business Today’s Conferences provide attendees with an opportunity to benefit from exposing themselves to diverse mindsets and viewpoints not only from many industries and companies, but also from different countries, universities, and backgrounds. True to our mission, the Business Today Conferences team connects influential executives and leaders with top undergraduate students to educate the leaders of tomorrow. 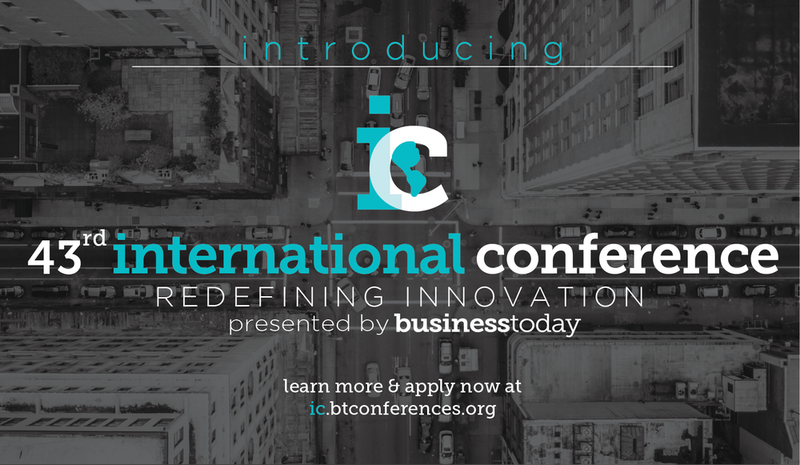 Through its International Conference, Designation Conference, and Women in Business Conference, Business Today connects smart, motivated, and diverse students with experienced executives who will share their expertise. Whether in their first or 43rd year, our conferences aim to innovate and improve, and hope to pass that spirit on to whoever joins us. The burden is on our generation to create innovation that stands the test of time. Fortunately, this challenge can be faced with the heartening presence of both mentors and peers. At the 43rd International Conference, we aspire to facilitate this exchange by creating a forum in which students and executives can connect and learn. I urge you to apply and to become an active part of the conversation and the Business Today family. Let’s redefine innovation and start our own revolution.